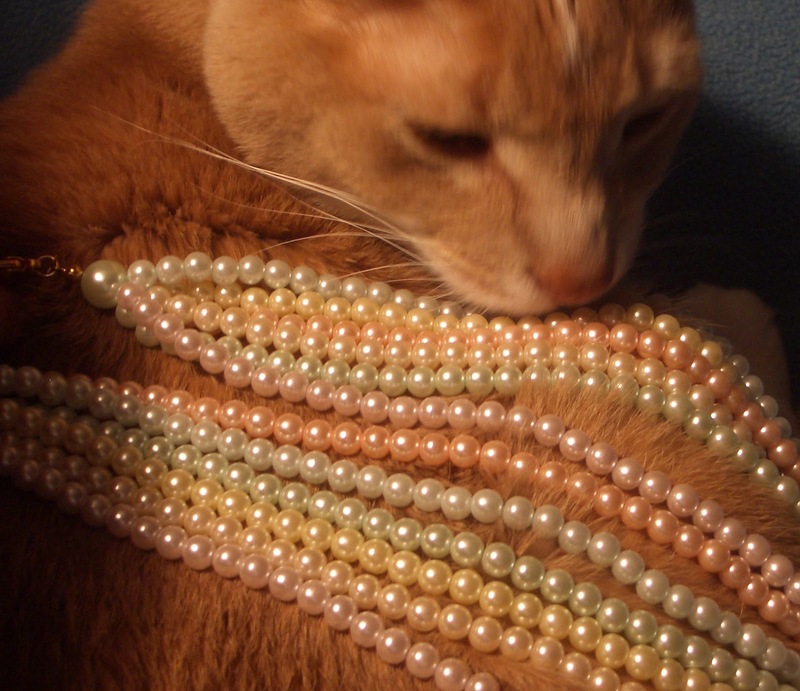 Happy Mew Year' Eve one and all. Mum's mum, who we have never met, used to say "Home is where the furniture is". Mum says it is that and where we are too. Mum worked lots around the house this weekend. She got crazy and took down the curtains in all of the rooms! Hey, we like some privacy you know, don't you? Not to worry, she washed them all and got them back up. Fresh smelling and clean. Plus she cleaned her sleepy spot room furry well. We will have to get to work getting stuff all furred up again. Mum says she is going to work her way through the house doing the major cleaning one room at a time. That means the sucking monster will be out a lot too. Guess we need to hide, but if she does one room at a time, we have the rest of the house to hang out in. The Pack - They losted to the ViQueens. They got off to a slow start, came back and it was tied. But the VQ's won it right at the end with a field goal. But they kept old Adrian from breaking the season rushing record. Plus now Da Bears didn't get into the playoffs either. The Pack is the number three seed in the NFC Now they play again on Caturday evening against the ViQueens. Deja vu? The Broncos - They beat up on the Chiefs and are the number one seed for the AFC and will get the next weekend off. Not bad for Peyton QB who sat out all last season. As we come to the end of another year, we would like to send our comforting purrs to those who lost a furkid or bean this year. Sending good vibes to the rest of our CB gang that we have a good 2013. More good vibes to all who are looking for a new day hunting gig (mum is one of them) and that the rest keep their day hunting places or find new ones. Good health to all. So we fondly look back at this past year on all that happened. In no particular order. Ducky's Gold Medal for High Jumping. Mum cheating on us when she visited down south. Us, just chillaxin' on the sleepy spot. Open windows and fresh airs in the spring. Ducky with the little cat ducks. Derby checking out mum's flowers. Mum taking a picture where you can see her. Staying home with us for a few weeks after her major medical overhaul. Plus we noticed that is is our 1502 post! Wowza, Over the past 7 plus years we got that many posts! So that is our wrap up. See you next year. For some strange reason, mum dug out a pretty necklace to wear at home. Even though she is sitting around in her grubby home clothes, not doing much of anything. Seems she found out about this lady from Max's mum Thumper. She is furry young and won't be living a long and full life because of breast cancer. They have tried lots of stuff, nothing seems to have helped over the years. She has decided that she won't do more treatments. You can go and read about her here, plus we give you a leaky eye warning. So some of her furiends decided to honor her by doing pearls. 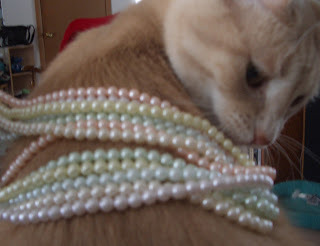 That is why mum broke out the fancy stuff to wear, plus we got to model with it too. It is purrty, six pastel strands of faux pearls. Mum even kept it on until she went to bed. It looked nice with her bathrobe. Mr Hawk paid us a visit this afternoon. Mum caught him on the flashy box just as he took off looking for something. We saw the birds scatter lots before he showed up. Guess they was nervous and knew something was going to happen. If he got anything, it wasn't in our yard. You can see the bands on the tail fevvers the best, towards the bottom middle of the picture. Otherwise, things are boring around here. We had a nice Christmouse, mum gave us some of her ham she ate. HiYa Ducky, it is furry true, we are here to keep you company. You are here to keep us fed, play with us, do things that require thumbs to do. Fair trade don't you think. We will have a white Christmouse. The storm left us enough snow, but not a huge amount of snow. Now it has been sunny but cold, so the snow isn't going away. The snow does make for easier fevver watching outside, the fevvers on the ground show up now. 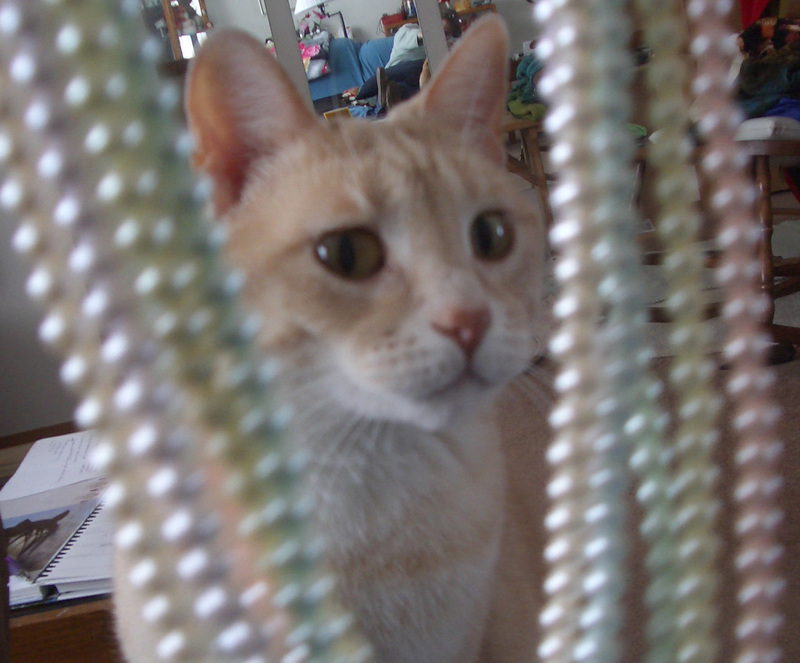 On late Caturday afternoon, we were sitting with mum in the chair and then one stupid dove flew right into the big window that goes to the floor. He landed, outside, then four more showed up to see if he was OK. So close, but yet so far. Would have made some good sized snacks for us. 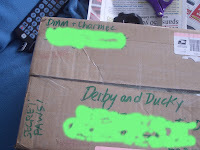 Finally mum let us open our Secret Paws from Daisy MaeMaus and Charmee on Sunday. Oh did we get a lot of goodies, gooshy foods and treats. We don't get lots of gushy foods so these will be treats. Derby yelling at mum to hurry up, he wanted to get going on the prezzie opening. He was in a mood on Sunday, First he was sitting on me really hard and putting the bitey on me. Mum told him he needed to be nicer. The cute little card, a kitten with a snow globe with a goldy fish in it. Mum put all of the wrapped prezzies on her sleepy spot, so we had a chance to sniff and see if we could pick anything out by smell. Lots of fevvers here on these mousies, and they are blind mousies, they have no eyes. A bigger ball with fevvers and a jingle ball inside. But look at all of these treats and noms. Oh wow, we will be feasting over the holidaze and into the new year. Surf and turf for new year's sound good. Some sushi type stuff and a catifornia roll. Salmon, tuna, crab! Another yummy choice. Plus something for mum, some hot chocolate mix with razzberry flavor. Mum loves razzberries and chocolate. DMM and Charmee, you done super good in picking everything out. We thanks you so so much. The Pack - What a game! They almost had a shut out! As it was we sent Tennessee guys home with a thrashing. The Pack seemed to be able to do most anything and scored 55, yes you readed that right, 55 points. The other guys got one touchdown and that was within the last two minutes of the game. Now they are for sure the number 3 seed for the playoffs and if the Niner's get beat, then they could be the number 2 seed. The Broncos- They won today as well and may have a chance to be the number one seed. One more weekend of games next weekend to end out the season. 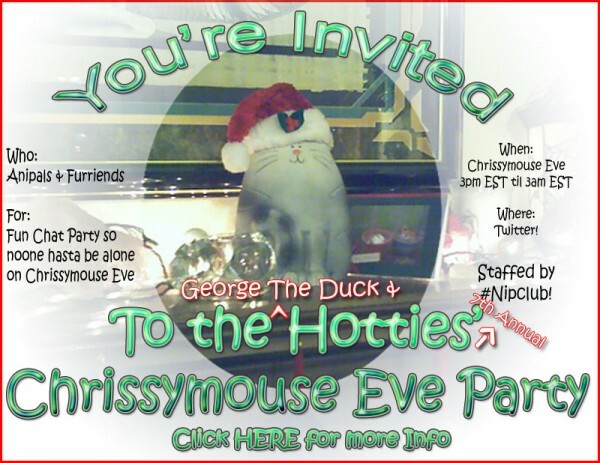 Party time - we will be stopping by the Hotties and George the Duck Christmouse eve party. This has been going on for a long time. Gives all of us a chance to reach out and be with others, even if just on the innerwebs. So iffin you have to be by yourself tonight, you don't have to be ALL by yourself. Stop in and have some funs. OK, we know some of you did your versions of the 12 days of Christmouse. So here is a rundown of those that we found. In no particular order. Ayla, Iza, Marley and TBT - they each did a version, so four different versions to go and check out. Cory - a mix of food and toys. Katnip Lounge - Mojave Desert theme! Those are the ones we found. Did we miss anycat? 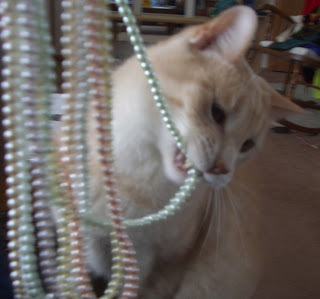 Then mum found this out on the innerwebs. It is from a place to go eat, but still funny. 12 days of leftovers. Our buddy Junior went to The Bridge yesterday. Farewell. We will be purring for his mum and fursibs to find comfort. 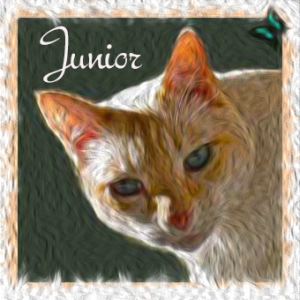 Would every cat, woof and bean send some purrs and prayers out to Junior. He is mightly poorly and his mum is worried about him. Seems he has some serious tummy troubles. Mum even got to meet him a few years ago. She was out doing work by the big salty lake and she worked it out that the mum's go together for dinner and then she met Junior. So Ducky and I are purring up a storm for Junior, get well dude. Well we have made it to another Monday. Christmouse is fast approaching. Mum finished making the last of the peanut brittle on Caturday. I managed to get some licks of the butter off the pan. Then later she was cooking and I managed to get some licks of the good stuff before she put the stuff in the oven. Although, on Friday, she came to see where I was and found me napping on the guest bed. So what did she do, she closed the door on me. Then she went and hauled a whole chick-hen out of the big cold box and took all of the meat off of it. I didn't get any! Ducky, who was a goody four paws, sat nicely and watched, so he did get some of the chick-hen. So all the more reason to bug her on Caturday while she was trying to cook and make stuff. Mum got bizzy on Caturday doing lots of with lots of washing. She even took apart our sleeping pod. She took out the inside stuffings and picked off lots of our furs by had. Then it went into the washing monster, along with our Gizzy quilts. Once it was all clean we both checked it out. I was the first to actually snuggle down and start of refur it. Mum took the picture from far away and I had my lazer's turned on. then I moved back in for a while. Smells all nice and fresh. Thanks mum for cleaning this up with weekend. The Pack - they beat Da Bears, so now they are the NFC North division champs. However, they did have some bone head plays, like getting cute on a punt reception, which they then fumbled. Plus, the place kicker has got to go, he misses more than he makes. He doesn't get the bounce to go his way either. He actually hit the upright on the goal post and it bounced back out! Mum says they won't go far in the playoffs if they don't have a kicker who can actually make a field goal. The Bronco's - beat up on the Balmer Ravens. So they have clinched the division title for the AFC West. The game was on at the same time as the Pack's game, so mum didn't get to watch it. She doesn't bop back and forth between games. HiYa, Ducky here. Oh we got a nice package in the mail. Goodies from my sweetest little lady Dora and her mum. Stuff for me, Derby and even mum too. Mum got the bag open and I began to sniff. Yep, I get the scent of a certain tortie ladycat. Lots of goodies, treats, toy, stuff for mum too, like lotion and the mints she likes. What is this neat little red thing with fevvers on it. I really can smell Dora on it. 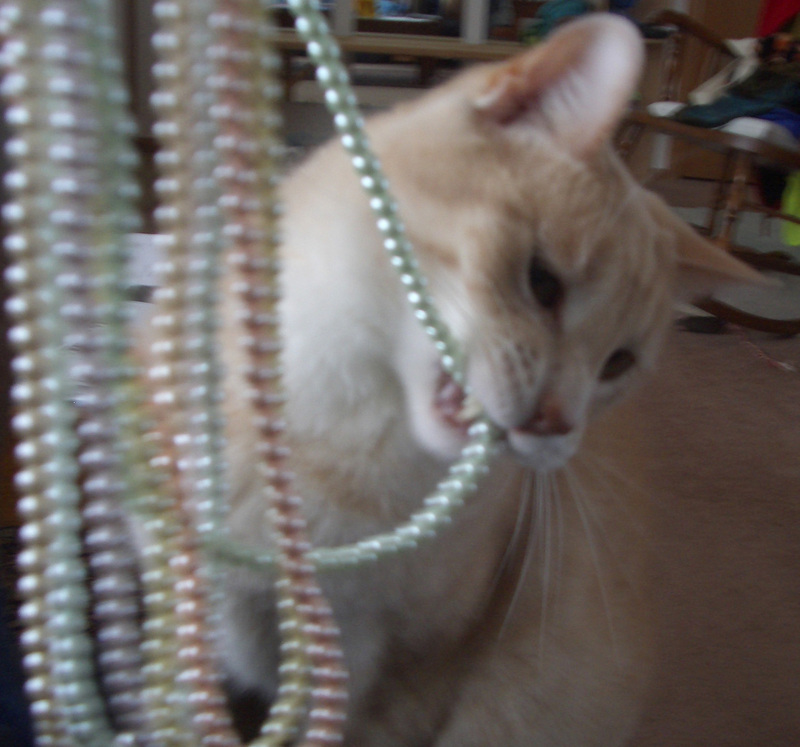 I grabbed it and took it to the floor so I could paw it around. Thank you Dora darling and your mum too. HiYa, Ducky here. Yep, that is me, checking out our little Christmouse tree. It used to be Grampie's, so mum uses it now and thinks of him. Soon it will be two years since he went to heaven. What is happening at Casa de D&D lately. Not much. It is sorta nice to have mum around during the day. We get more scritches since she is around. Someone to sit on and get heat from too. I love sitting on her boobities and doing biscuits on them. Mum call me her breasts examiner, MOL. Plus since mum is around, the house is actually warmer during the day. So she doesn't get cold while she works on stuff. She is on the puter, on the phone about bizzness. Plus she is good about going outside and getting a good walk in every day. Well except on Sunday in the rain and snow. Today she mailed our out of country Christmouse cards and a few other things. She still has some cards to work on, mostly those she needs to write stuff in. Otherwise, all is good. Yes, here on earth, we are better than angels. We only become angels when we get to The Bridge. Some of the white stuff on Sunday, not much and at the official weather guesser station, they got no snow, so we has set a record of days without measurable snow. 280, last measurable snow was way back on March 4. Top picture is just had changed from rain to snow, if you biggify you might be able to see the snow flakes. Bottom picture was about 4 hours later. Mum spent Sunday afternoon working on the Christmouse Cards, we both snoopervised her from time to time. Otherwise we spent our afternoon doing this! Go visit Spitty, he did his own version of the 12 days. The "Rodentia Version" as he calls it. Go and see it, it is grate. Or you can see it in our last post comments. Anyone else come up with a new version? If so, we want to know. The Pack - played on the snowy frozen tundra of Lambeau field against those Lion guys. Didn't we just beat them a couple of weeks ago? Well we beat them again. Go back to the mitten state, you haven won in Lambeau for over 20 years. In first place in the black and blue division! The Broncos -played last Thursday and won. Mr Black challenged us to take out the rest of the regular things in the song. We made them all sea creatures. We hope you enjoy. And a minnow in a little bowl. So our challenge is, can you do the 12 days with another set of creatures? No birds or people stuff. Our buddies over at Trout Talkin Tabbies don't like the song 12 Days of Christmouse, because it has fevvers in it. 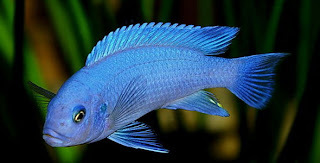 So we got mum to help us and took out the fevvers and put fishies in it instead. So we will only do the final run down of the last verse. Interesting times here at Casa de D&D. Mum came home furry early in the day on Tuesday and is home with us today. Mum says it is not bacation. So why is she here? Mum says they don't need her to come and day hunt anymore. How are you going to buy us noms, treats, toys???? Mum what is going on???? Will you run out of green papers and your plastic money??? Mum we is all worried. Mum says not to worry. Firsted, she is getting a "package" but not one from the guy in the long blue shorts. But from her company. They will be paying her for some time to come to not show up and day hunt. Hey, that is our kind of job. Get paid for not doing much of anything! Plus mum says there is saved green papers in the bank, plus she is looking for a new day hunting gig even as we write this out. Phew, she is doing the right thing. But if you have any extra pull, purrs, prayers, mojo, vibes, send them her way. We may not be able to keep her on track by ourselves. Now, back to our regularly schedule Wednesday naps in the sun puddles. According to and old European folk tale, when cats were first created they had wings, but they preyed on birds and threatened them with extinction. So God took away their cat wings, though he turned their flutter into a purr, reminding kittens of the time and form which they were most content. Interesting, kitties used to have wings? Maybe that is why we can now jump good, to get a chance to be up in the air. Launch ourselves up into the air. Speaking of air, we got fresh airs the weekend. It got sort of warms here so mum had her sleepy room window open and it was open all night! Plus we had a thunder boomer storm late on Caturday afternoon. 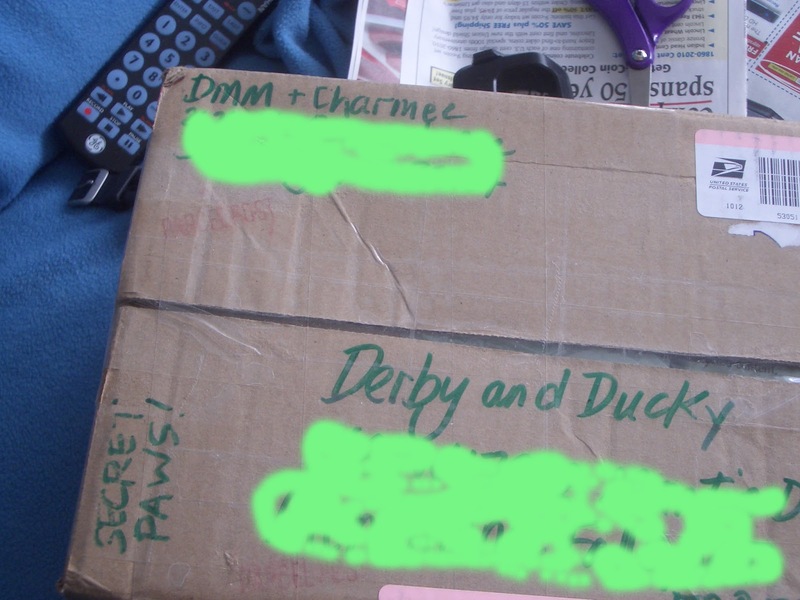 Our Secret Paw stuff arrived from DMM and Charmee. Mum opened the box, but won't open the lots of little prezzies inside until Christmouse gets here! Bummer mum, we want to know what we got. 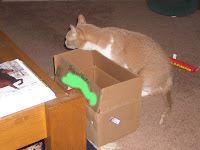 Now we have a box to send the stuff we have to our Secret Paw kitty. Come on mum, you know we can't wrap the stuff up on our own. Plus the tape would stick to our furs. The Pack - The good team showed up today, beating the ViQueens. Mum was happy and with Da Bears losing, the Pack is back in first place. The Broncos - They won over the Tampa Bay Buc's. They are in first place in their division too. Whoohoo, two for two this weekend.